Tourism in the Flinders Ranges. Rugged mountains, peaceful gorges and sheer cliffs, abundant wildlife, wildflowers, tree-lined creeks, picturesque waterholes and evidence of successful human struggle but also many heart breaking failures, all await the tourist to the Flinders Ranges. Tourism in the Flinders Ranges and Outback has grown from a small base to become a major growth industry. During the 1999-2000 financial year the area attracting more than 700,000 overnight visitors, who spent more than $90 million. Tourists have been visiting the Flinders Ranges for a very long time. As early as 1866 Bailliere's South Australian Gazetteer and Road Guide was published. It contained 'the most recent and accurate information as to every place in the colony'. Among the many entries were a large number from the Flinders Ranges including Angepena, Angorigena, Appaanana, Arkaba, Aroona, Artipena, Balcoracanna, Beltana, Blinman, Devil's Peak, Edowie, Freeling Heights, Hookina, Itelowie Creek, Kanyaka, Leigh's Creek, Mattawarrumgalla, Melrose, Nuccaleena, Oomberatana, Ooraparinna, Parabarana, Pekina, Petalinkina, Saltia, Unawurtina, Willochra, Wilpena, Wirrabara, Wonoka, Wooltana, and Yudanamutana. Since that time many of these names have changed their spelling whereas others have become ghost towns or disappeared from the maps altogether. Although some of the names have disappeared, the physical evidence of their roaring days, when the sky was the limit, has not. It is still possible to visit some of these sites and imagine what it would have been like in 'the good old days'. Tourism received its first real boost when the railway moved from Port Augusta through the Pichi Richi Pass and north to Beltana and Leigh's Creek before continuing its way to Lyndhurst and Farina, finally reaching Marree in 1883. The South Australian Railways advertised both the scenery and excitement of a trip to the north in an effort to attract customers. The railway gave birth to several new towns such as Quorn, Hawker, Wilson and Parachilna. To keep the trains running, water and firewood were needed in large quantities. This created local employment as did the hotels who served passengers on the train. Towns which had a break of gauge did even better as passengers often had to wait several hours, or stay the night before they were able to continue their journey. At the same time railways helped reduce transport costs of goods and services to existing towns, and those newly created towns in the late 1870s, as a result of the agricultural industry expanding beyond Goyder's Line. Before cars became a common form of transport, railways made it possible for people living in the ranges to attend race meetings in nearby towns, visit a nearby doctor or a hospital or even make a trip to Port Augusta or Adelaide. The high price of a ticket though made it often difficult for large families to use its services. After its completion as for north as Marree, people from Adelaide and other places south of the Flinders also used the train to visit this area and enjoy its attractive landscape. These early tourists looking for the silence and splendour of this ancient landscape were the forerunners of the thousands who would later wonder why it had taken them so long to appreciate the attractions of this semi-arid region with its beautiful mountains, waterholes, vegetation and animals. During the 1920s, when cars did make trips to the Flinders Ranges, the Paralana Hot Springs Syndicate established spa facilities at Paralana. As the location was very isolated, and accommodation rather Spartan, the venture did not last long. Unmade roads, deep and rough creek beds were a problem in the days before 4WD's but it never stopped people from coming. The road to Leigh Creek was not sealed until the 1980s. Today many people who visit the area seem to be unwilling to leave the main road, afraid in case their shiny 4WD will collect a little dust! They miss much of the most spectacular scenery and rich history of the ranges. In the 1930s, before there were sealed roads north of Port Augusta or Melrose, Bond's Scenic Motor Tours and Bastin's ran weekly coach tours during winter and spring from Adelaide to as far north as Parachilna and Blinman. 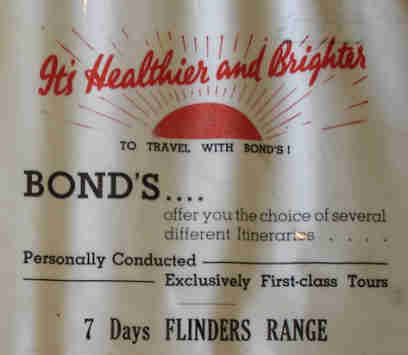 Bastin's Flinders Ranges Tours offered a seven days' trip, all inclusive for eighteen pounds and ten shilling. By 1948 Bond's had completed the Wilpena Chalet. In 1945 the South Australian government acquired Wilpena Pound to make it possible for more visitors to enjoy this part of the Flinders Ranges. In 1972 it became part of the Flinders Ranges National Park. Tourism has been facilitated to a large extend by both the pastoral and mining industries. Whereas the pastoral industry made graded tracks and watering points, the mining industry later improved these much needed facilities. Both industries, and several others, have left numerous buildings, equipment and other evidence of their struggles to wrest a living from this beautiful but harsh environment. It are these remnants, and the peace and quiet, which are also reasons for today's growing number of visitors spending time in the Flinders Ranges rather than anywhere else. It is now one of the most popular tourist areas in South Australia. 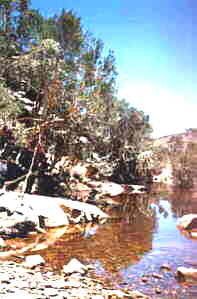 Much has been done to preserve the unique flora and fauna of the Flinders Ranges. The goat and rabbit problems have almost been solved and the Yellow Footed Wallaby has been allotted several special areas for its protection. There are several Aboriginal and fossil sites of world importance which are also protected. More recently many of the pastoral properties have opened their gates to welcome the tourist. Some provide basic facilities such as shearers' quarters with a bed and a shower; others have greatly improved on this and provide a full range of services. A much improved service was added recently when Joan Hall, Minister for Tourism, officially opened the new airport at Hawker. Further attempts to improve visitors' facilities and general economic development in the Flinders Ranges are made by the Outback Areas Community Development Trust and the Northern Regional Development Board. A major objective of the Northern Regional Development Board is 'to bring about a high quality of life for residents throughout the Northern Region. The on-going decline of the pastoral industry, principally wool production, in the Flinders Ranges has severely affected the economic well being of businesses and residents of the Flinders Ranges, and tourism and associated business activities are important new opportunities'. The Board also aims to 'increase visitor expenditure and length of stay in the Region, improving the range, quality and quantity of products of the Region available for sale to visitors and the development of a quality art and craft industry'. For those people who can stay longer, there are the Private Parks, such as Arkaroola and Buckaringa as well as several Conservation and National Parks in the Flinders Ranges. They are ideal places for bush walking, bike riding, bird watching and photography. The largest, and most spectacular, of these parks is the Vulkathunha Gammon Ranges National Park in the far northern area of the Flinders Ranges. For the active visitors who have plenty of time, there are the Heysen and Mawson Trails. The Heysen Trail is a 1500 kilometre walking trail that extends from Cape Jervis on the south coast to Parachilna Gorge in the Flinders Ranges. It was first proposed in 1970 and completed by 1992. The trail passes through some of the most scenic parts of South Australia including some national parks, state forests and world acclaimed tourist areas. The trail, which one day may finish at Mount Hopeless, caters for both backpackers and day walkers. There are several huts, hostels, home and farm stays incorporated to make the going a little easier. The Mawson Trail is approximately 800 kilometres extending from the Adelaide Festival Theatre to the town of Blinman. It has been designed for touring cyclists and mountain bike riders to travel through South Australia's remote rural areas. This trail, which at times can be very difficult on some of the steeper sections, has been located away from the main roads. Instead it winds it way over country roads, through state forests and national parks. It has also incorporated many farm access tracks and unmade or unused road reserves. On both trails, the hard physical work is always rewarded by spectacular views, abundant wildlife, unique flora and extensive vistas over mountain ranges or wide sweeping plains. One of the major benefits resulting from the increased number of tourists is the interest in retention and conservation of the numerous structures which can tell something of the past. As more and more people become acquainted with the rich history of the Flinders Ranges it will be imperative to preserve as much of the physical and natural evidence as is possible. Tourism has also been boosted as a result of the different forms of Arts practised in the Flinders Ranges.